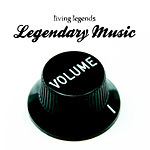 The Living Legends crew hooks you up with a special-price sampler for 2006 with one solo song from each of the crew members' upcoming solo releases as well as unreleased tracks from G&E and 3MG. Volume 1 was originally promoted as a prelude to an official 10th Anniversary release, but stands on its own regardless. Production by Eligh, The Grouch, Scarub, Bean One, Hecktik, Dirt Nasty, DJ Fresh and Brycon.